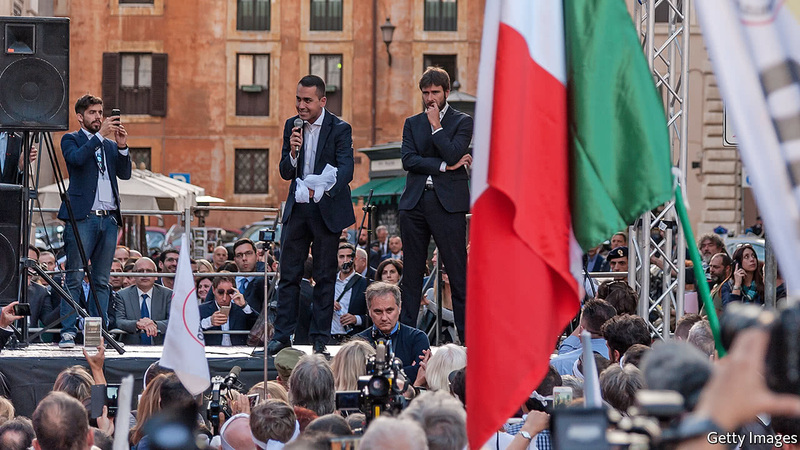 FOR the first time in its brief history, Italy’s maverick Five Star Movement (M5S) is going into a general election campaign as the front-runner. On December 28th President Sergio Mattarella dissolved parliament, clearing the way for a vote on March 4th. The latest polls give the M5S, which advocates direct, internet-based democracy and a hotch-potch of left- and right-wing policies, a lead of more than three points over the centre-left Democratic Party (PD), the dominant partner in Paolo Gentiloni’s coalition government. The inexperienced M5S, founded less than nine years ago, could thus get first crack at forming a government—a prospect that troubles markets already worried by Italy’s huge public debt (132% of GDP at the end of 2016).